The Providence RI Tercentenary Half Dollar Classic Commemorative Coin celebrated the 300th anniversary of the founding of Providence, Rhode Island by Roger Williams in 1636. On May 2, 1935, the first session of the 74th Congress approved an act which became Public Law 74-48 that authorized both the Providence RI Tercentenary and the Hudson NY Sesquicentennial coins. The law began, "That, in commemoration of the one hundred and fiftieth anniversary of the founding of the city of Hudson, New York, there shall be coined by the Director of the Mint ten thousand silver 50-cent pieces, and in commemoration of the three hundredth anniversary of the founding of the city of Providence, Rhode Island, there shall be coined by the Director of the Mint, fifty thousand silver 50-cent pieces, in each case such coins to be of standard size, weight, and fineness of a special appropriate design to be fixed by the Director of the Mint, with the approval of the Secretary of the Treasury, but the United States shall not be subject to the expense of making the models for master dies or other preparations for this coinage. "SEC. 2. Coins commemorating the founding of the city of Hudson, New York, shall be issued at par, and only upon the request of the committee, person, or persons duly authorized by the mayor of the city of Hudson, New York, and the coins commemorating the founding of the city of Providence, Rhode Island, shall be issued at par and only upon the request of the Providence Tercentenary Committee. "SEC. 3. Such coins may be disposed of at par or at a premium by the committee, person, or persons duly authorized in section 2, and all proceeds shall be used in furtherance of the commemoration of the founding of the cities of Hudson, New York, and Providence, Rhode Island, respectively." The law continues in Section 4 stating that all laws already in place applying to coinage shall also apply to these coins. "SEC. 5. The coins authorized herein shall be issued in such numbers, and at such times as they may be requested by the committee, person or persons duly authorized by said mayor of Hudson, New York, in the case of coins issued in commemoration of the founding of that city, and by the Providence Tercentenary Committee in the case of coins commemorating the founding of the city of Providence, Rhode Island, and in each case only upon payment to the United States of the face value of such coins." The coin's silver content alone makes it more valuable than its face value of $0.50. But, the coin's age, its condition, and its desirability make it even more valuable as a collectible. The coin's estimated value ranges from $70 (low grade - XF) to $210 (high grade - MS-66). Extraordinary characteristics on the Providence RI Tercentenary Half Dollar can command a price outside the estimated value range. The obverse or front of the coin shows an Indian at Slate Rock welcoming Roger Williams. Williams in a canoe holds a bible in his left hand with his right hand raised in greeting. The sun rises over the ocean in the background. The coinage inscriptions say, 1636 Rhode Island 1936, In God We Trust, and Liberty. 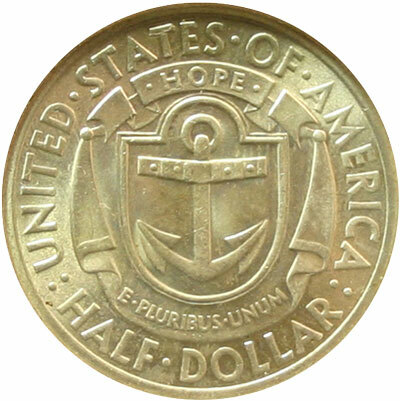 The reverse or back of the coin displays the shield of the State of Rhode Island with its banner of HOPE above an anchor. The coinage inscriptions read United States of America, Half Dollar, Hope, and E Pluribus Unum. Though the stated mintage limit was "fifty thousand," records show an additional 34 over the 50,000 limit were minted. Versions of the coin also exist across a variety of the grades. Because of his controversial freedom of worship ideas, Roger Williams with his wife, Mary, left England and arrived at the Boston colony in 1631. But, his freedom of religion beliefs were too different from the structured puritan beliefs. He left Boston and preached at Salem and Plymouth. Still too controversial, the colonists were about to deport Williams back to England. He fled the area, moved southward and founded Providence. Roger purchased land from the Narragansett Chiefs and named his settlement Providence in thanks to God. In his charter for the area, Williams stated, "No man shall be in any wise molested, punished, disquieted, or called in question for any difference of opinion in matters of religion which does not actually disturb the civil peace of the colony." 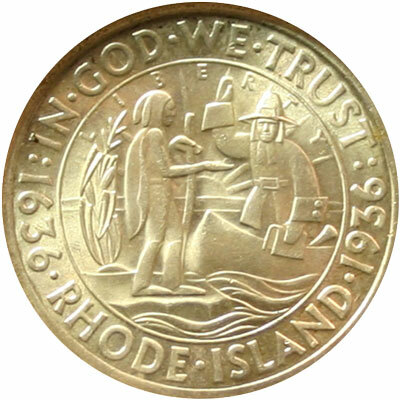 The Rhode Island State Seal was first adopted in 1664 and varies only slightly from the image on the reverse of the Providence RI Tercentenary half dollar coin. Visit our GACS Numismatic Shoppe Providence RI Tercentenary for a variety of useful items decorated with images of the classic commemorative silver half dollar coin.